This is part 4 of 5 of an interview with Art Pollard. Be sure to start reading with Part 1. Leave your questions and thoughts in the comments. Art will be available to comment on anything you have to say. How many people work at Amano? There are a total of three of us! That’s it! We all work immensely hard. It still makes for some rather long days. I read on your site that your location of Salt Lake City helps in the chocolate production. Can you talk more about that? There are two different issues. Utah is very dry and arid or at least our particular location is. That’s very important during several stages of the chocolate making process. The altitude means we have a lower vapor pressure so that affects which volatiles are escaping from the chocolate at various temperature points. Volatile oils and other chemicals such as ascetic acid are able to evaporate at a lower temperature just like water boils at a lower temperature than it does as sea level - it’s a similar sort of thing when you make chocolate. Of course, you’re not trying to boil it, but a similar process occurs both during roasting and conching as far as some of the different chemicals that will escape. You have to be pretty careful to make sure that you are allowing things to escape that are detrimental to the flavor of the chocolate and you are keeping the chemicals that you are trying to enhance. Historically in the U.S., chocolate has been made in port cities. That has a lot to do with the fact that that is where the cocoa comes in from the other countries so it’s made it easy for them. But, I think that our altitude here makes the shipping well worthwhile and I think we are able to offer something that is a little bit different and would be more difficult for someone to replicate at sea level. Of course your port cities are also classically highly humid and that is going to affect things as well. 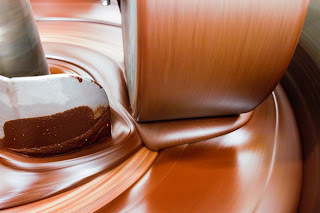 What has the process of marketing your chocolate been like? Interesting. Initially, my thoughts were that if we came out with a superior product that we would make some waves and it wouldn’t be that long to see it on the store shelves. I was wrong. We did release a superior product. As far as chocolate goes, I think we’ve been releasing fairly consistently chocolate that is some of the best in the world. A lot of people have recognized that and that’s truly satisfying and that’s the best thing in my opinion about doing what we are doing -really making something that makes people happy. Getting on the store shelves turned out to be a whole other issue. That’s been a little more difficult than what we originally thought. We’ve gotten into a fair number of stores, but not where our initial projections hoped that we would be. I think a lot of stores have a really long turn around cycle from the time they are interested in you to the time that you actually show up. The various buyers have more things to do with their life than to worry about each individual product that they are trying to get in. They have families and they have to deal with their current product selection. A lot of times, your cycle to get into to a given store is a lot longer than your initial estimate. Some of your smaller independent stores can make a decision and get you in in a week’s time, but other stores that have a bit more management or more formal processes can take six months or more. It’s all very interesting. Some stores can take upwards of a year. Will this Food Interviews site be all chocolate-related? Either way, an interesting blog idea! Fascinating story. I can't wait to taste this chocolate! I find the idea of humidity and altitude affecting the chocolate to be interesting - and like much of this interview - reinforces to me how chocolate really is like wine. I'm really enjoying this series, thanks again. Thank you for your enlightening interview. It is always interesting to read articles that give a peek inside the real world of what makes a product great. Your dedication and standards as well as patience are greatly appreciated and are reflected in your product. It is refreshing to know that there are people out there with vision and the conviction to work to see it through. I am happy that we get to share the rewards of your hard work. I just learned that Art and Amano Chocolate will be participating in the Taste Pavilion at Slow Food Nation ... I can't wait! Very cool. I love that Amano is nearby where I live here in Utah. I never knew that weather could effect chocolate production like this. Only three people? I'm impressed! God that photo is beautiful! I'm learning more with each part of this interview. Please don't stop yet! Jams: Glad you like the photo. If you would like to see additional photos from around the factory and on some of my trips, I have some of it on my Flickr account. It is a small subsection of my overall photography in cocoa growing regions and I can only show a few areas since it isn't too wise to tip off where I've been working and what beans I'm interested in or what might be on the horizon product-wise. GREAT photo! I could stare at it all day. Thanks for sharing! Can't wait to try some someday. Good chocolate is such a treat. Look like a lot of work goes into good chocolate other than the source of cocoa. I absolutely love the picture on this page..... Makes me want some chocolate, right now ! Great interview. My view of chocolate has changed. You mention the different chemicals involved in the roasting process - makes me wonder how high-tech your processes are. Are you doing chemical analysis of the batches, or is it all experience and taste? It's really interesting to learn about how chocolate is made, particularly altitude and location (I'm not too far from port cities...did someone say chocolate raid? Mt prior thoughts on chocolate solely concerned how to open the wrapper fast so I could get the stuff in my mouth ASAP. That photo looks absolutely delicious. I guess if I decide chocolate making if for me, I should move away from the hot and humid south-east. This has been an enlightening series! Thanks Stef for doing this and thanks Art for participating! I hope to see your chocolate on store shelves near me soon. It sounds amazing. Are you selling your delicious chocolate in the Phoenix area yet? I'd love to buy some love chocolate for my mother-in-law for Mother's Day. I just might have to get some for me as well!